I pride myself on providing complete reports that are easy to understand. You won’t be overwhelmed with information you don’t care about. Just factual information about the property and its condition–and annotated, color photos to clarify your understanding. It’s all organized in an easy to follow format. Your report is completed within 24 hours, most times the very same day (larger inspections may need more time to complete the report) and made ready for your review and retrieval right here on my website. You're actually purchasing information and expertise from me and you should be able to reference that information at anytime. That's why I make your report available online in PDF format within 24 hours, most times the very same day. You will receive a direct link to your report via email. You can also provide the link to others so they can review the report. Contractors, realtors, the seller…anyone who needs to see your report can view it right on their computer. It can also be printed of course. 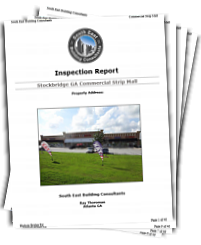 All commercial building inspection sample reports are in PDF (Adobe® Acrobat®) file format. You must have a PDF reader in order to view these reports.